The WHOPPER® is America’s favorite burger and there are people who just can’t wait to enjoy it, literally. Or at least that’s what we figured out after seeing a huge number of car crashes at our restaurants every year. 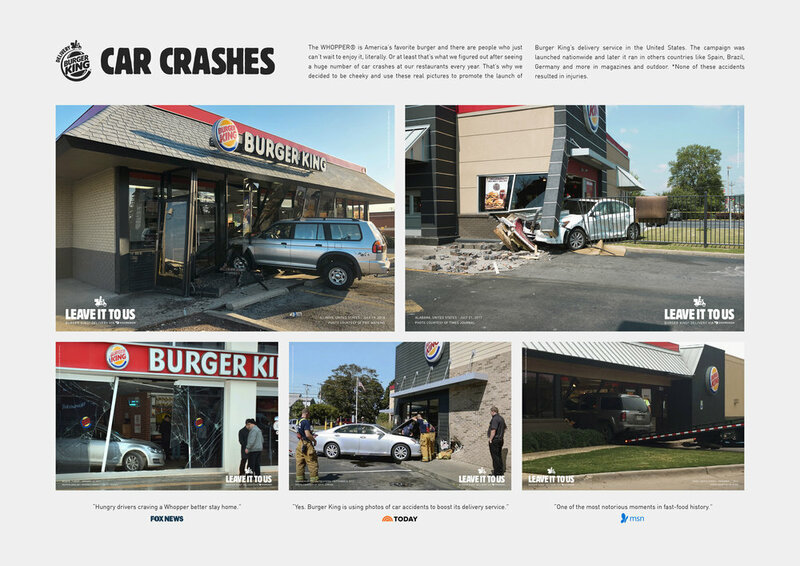 That’s why we decided to be cheeky and use these real pictures to promote the launch of Burger King’s delivery service in the USA. The campaign was launched nationwide and later it ran in others countries like Spain, Brazil and Germany in magazines and outdoor. *None of these accidents resulted in injuries. Fox News, USA Today, AdWeek Editor’s Pick, Lürzer’s Archive Ad Of The Week, MSN, Muse by Clio, Design Taxi, Ads of the World, The Drum, Graphic Design UK and more.